Like all food and beverage trends, fads in the coffee world come and go. Just look at the menu board of your closest Starbucks, where the typical lattes and cappuccinos share space with nitro cold brew, single-origin beans, and the occasional Instagram thirst trap like the Unicorn Frappuccino. Indie coffee houses aren’t immune, either, what with the recent surge in turmeric lattes and the infamous oat milk shortage. But as coffee trends wax and wane, one saccharine-sweet, artificially flavored coffee accompaniment has, for millions of coffee drinkers, remained omnipresent: coffee creamer. According to market research firm Packaged Facts, overall retail sales for refrigerated coffee creamer in the U.S. neared $2.5 billion in 2015. But it should come as no surprise that creamer is big business: Just take a stroll through your grocer’s dairy section, where shelves upon refrigerated shelves are home to numerous varieties. There’s sugar-free, all-natural, almond- and soy-milk based, and Starbucks Frappuccinos have nothing on the creamer industry in terms of sheer number and variety of flavors. In addition to the stalwart flavors like vanilla, hazelnut, and Irish cream, the big creamer makers are constantly releasing new flavors, many of which are collaborations with iconic sweets brands like Reese’s, Oreo, Snickers, Cinnabon, Hershey’s, and Girl Scout Cookies. While drinking coffee black may carry a certain cache (look at fictional characters like Twin Peaks’s Dale Cooper for evidence of the tough-guys-drink-black-coffee trope), the fact is most people sweeten and/or lighten their coffee. Lauren Start, senior brand manager for coffee creamer giant International Delight, says that “while two-thirds of adults in the U.S. drink coffee, nearly 80 percent add something delicious to their cup,” be it flavored coffee creamer, milk, and/or sugar or another sweetener, citing data from the National Coffee Association’s 2018 Coffee Drinking Trends report. 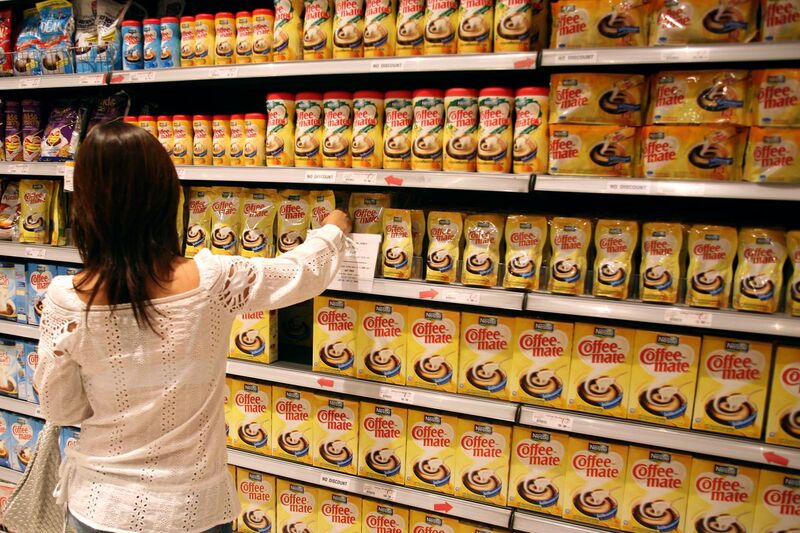 A lot of people are drinking coffee creamer, and it can’t just be your parents. That’s despite a strong pretension against using flavored coffee creamer among certain sects of coffee drinkers — a sentiment that can at least partially be owed to the so-called “third-wave” coffee movement that took hold in the early 2000s. To say nothing of flavored creamer, many coffee aficionados insist that the only proper way to drink coffee is black, no sweetener or milk of any sort in sight, which can obscure the flavors and aromas of quality beans. Flavored creamer may be the most normcore thing one can add to their coffee, but the numbers don’t lie: The refrigerated liquid coffee creamer market has been steadily growing. A lot of people are drinking it, and it can’t be just your parents. The reality is not all of us are brewing single-origin beans in a French press or frothing up oat milk turmeric lattes every morning, making creamers a pleasant flavor addition. “I don’t make the best coffee,” admits Liz Sigue, a software analyst from New Orleans, who says using creamer helps the “daily maintenance coffee” she brews at home when she can’t make it to a coffee shop for a nitro cold brew or other fancier beverage. Others use creamer situationally, such as to give watery diner or office coffee a boost or to doctor up a cup of Folgers brewed at their parents’ house. Coffee snobbery aside, much of the more recent backlash against coffee creamer has to do with the “natural” foods obsession that began in the early aughts. News articles and blogs warn that coffee creamer could contain titanium dioxide, hydrogenated oils, dipotassium phosphate, and artificial flavors — though none of those substances have been shown to be harmful in the minuscule quantities contained in the couple tablespoons of creamer that the average person likely uses on a daily basis. Indeed, sales of “natural” coffee creamer products have boomed in recent years, such as Coffee Mate’s Natural Bliss line, which launched in 2011 touting no GMOs and no artificial ingredients. The line also reflects the rise of alternative milks, and now includes coconut milk and almond milk creamers. International Delight is hopping on the “healthier” bandwagon, too, with recent or forthcoming product launches in the plant-based, organic, and/or sugar-free categories. Judging by the way sales of coffee creamer continue to rise, it seems evident that the increasing popularity of indie coffee shops, fancy brewing methods, and availability of better coffee overall isn’t hurting the creamer market. In fact, Ana Defendini, marketing manager for Coffee Mate, Nestle USA, thinks the rise of “third-wave” coffee has only helped the creamer biz. “If anything, I think all of that stuff that’s happening in what we call out-of-home coffee [coffee shops, etc.] is encouraging consumers to be more adventurous, and just be more willing to try new flavors that they wouldn’t have before,” she says. In corporate retail lingo, Coffee Mate has “borrow[ed] from coffee house equity” by launching coffee shop-inspired flavors like caramel macchiato and, more recently, an oat milk creamer to capitalize on the runaway popularity of Oatly, an alternative milk that coffee shops couldn’t keep in stock a few months ago. Whitney Filloon is Eater’s senior associate editor.